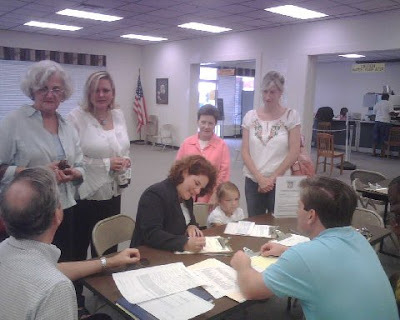 The act of qualifying for the Ward 5, Post 1 Macon City Council Seat, that is. Qualifying for all seats ends tomorrow. 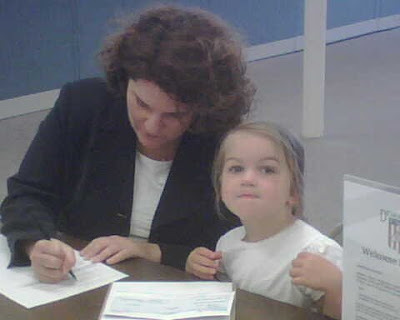 As you can see in the pictures, her special assistant, and Goddaughter, Isabelle Cusson, was among those accompanying her to the Board of Elections. Best of luck, Lauren. You'll do a great job on City Council! That's great news for Lauren and for Macon. Unopposed, is that correct? Congrats, Lauren. You go girl! Lauren would be great on city council ! (or the legislature or the congress or the senate, for that matter...) :-) Rah, rah, rah !! Yay for Lauren. Sometimes good things do happen to good people! She'll do a great job on Council. Baptists Challenged to "Outbreed the Mormans"
Let's Get Rid of Partisan Elections? Another Republican in the Macon Mayor's Race?